“WRC is for boys, Group B was for men” – this was how four-time rally world champion Juha Kankkunen summarised this cult era of rallying in the mid-1980s. Although short-lived (1982-1986), the Group B World Rally Championship was a compelling era of manufacturer-funded entries which pushed the boundaries of the sport. With no strict technical regulations enforced, Group B cars were sophisticated and very powerful, and it was this outright pace that ultimately led to their demise. Following a series of accidents the FIA was forced to ban the Championship for 1987. This Lancia Delta S4 is the 1986 Monte Carlo Rally-winning car driven by Henri Toivonen with co-driver Sergio Cresto, who both tragically lost their lives in a sister car later in the year on the 1986 Tour de Corse. 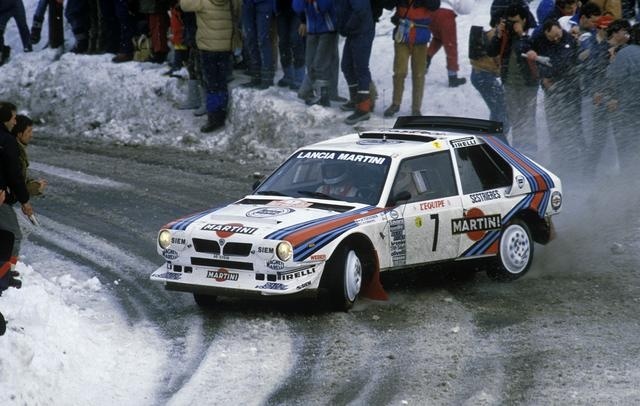 An evolution of the Lancia Monte Carlo-derived Rally 037, the Delta-based S4 featured four-wheel-drive and a mid-mounted 1759cc four-cylinder engine that combined a supercharger and turbocharger for maximum power and reduced engine lag at low revs. The car proved competitive from the outset, winning its first event, the 1985 RAC Rally, and in 1986 it took three wins; the Monte Carlo Rally, Rally Argentina and the Olympus Rally. This definitive S4 in original time warp condition has been lifted from the Group B history books. It can be seen on display at the 2014 Concours of Elegance at Hampton Court Palace between 5-7 September.